Between 2010-2012, it was an absolute pleasure to meet so many Australian Professional Parents in Brisbane and on the Sunshine Coast at Professional Parents past events. In mid 2012, our family relocated to The Netherlands. It’s taken quite some time to find my feet and resettle here, but something I learnt in my conversations with both expat/international parents and Dutch parents was that there were very similar issues here in relation to balancing business and family. 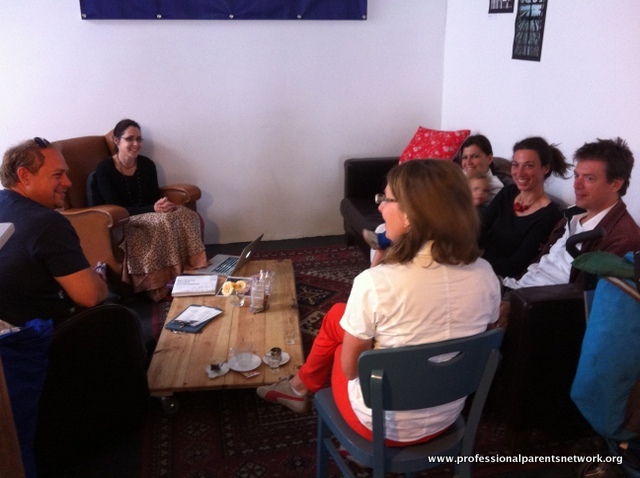 So today, I hosted our first Professional Parents event in The Netherlands, at Blueberry Cafe in Delft. Owner, Taco, is super supportive of all his customers, whether they be internationals or dutch “locals”. Isabella and I arrived early (after dropping big sister Sophia at school) and settled down with a hot chocolate and freshly baked croissant to prepare for the meeting. She is almost 4 and doesn’t she just look so grown up and ready for a business meeting? When our Professional Parents began to arrive, I was really thrilled to welcome both mamas and papas – along with some gorgeous children too of course. 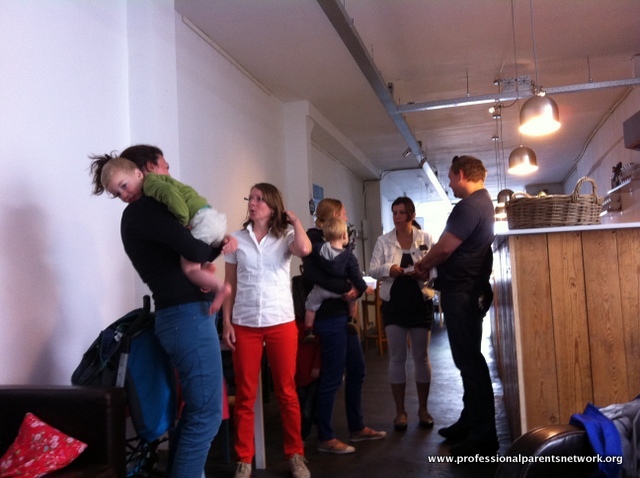 (For those new to Professional Parents the key concept is that it’s business networking – but babies and children are always welcome should you need to bring them). Please take a few moments to check out these businesses and support them or refer business where you can! We enjoyed good food, drinks and conversation – getting to know each other a little better. It was a very international group and interesting to see that no matter where we are from and which industry we work in, we all strive to reach that family business balance. Though I do enjoy meeting with groups of mamas, I really liked having the input of the other side of the parental equation at this meeting too. We agreed having a business plan is important but can be time consuming to prepare and not always kept up to date. I shared a model I discovered about a year ago which I love using – a simple but effective one page business plan called the Business Model Canvas. Follow that link for the free pdf download and a short video explaining it. Love to hear your thoughts in a comment below! There is also a book you can purchase if you want to go more in depth, but many find the free material is enough. In our personal lives, some of us were more rigid planners and others liked to “go with the flow”. No matter which, we realise that especially in a busy life balancing business and family, there can be many unforeseen circumstances such as sick children on important work days, so you may have to have a few back up plans in place! Using a secretary is one great way to stay organised if you can! If that’s beyond your business size and budget then tools such as digital calendars can be helpful. Ultimately, you need to find a system that suits you and your family but we agreed it’s good to have a mix of structure and some more unscheduled time for uncertainties – and simply some fun! If you have any tips relating to the topic of planning, particularly in the area of balancing business and family – for example, a great app, a super system or other ideas, please share in a comment below. We talked a little longer then went our separate ways, back to the balancing of business and family! Interested in joining future events in The Netherlands? Please contact us. Not in The Netherlands or unable to join our events? There are still plenty of ideas, inspiration and resources and support online on the Professional Parents website for you to find your best family work balance. You can browse through the blog, get to know other Professional Parents in our people interviews (or contact us to share your story!). List for free in our Professional Parents Directory and shop there to support others, and we’d love you to come and join our worldwide community on the Professional Parents Facebook Page. Tweet us at @proparents. This post was written by Renee Veldman-Tentori – founder & community manager. Read more about the Professional Parents story. How exciting Renee! Well done! I wish I knew! I would’ve loved to join all of you! Great post and I hope to catch up with all of you next time! Wow, really impressed with your layout and report write up!